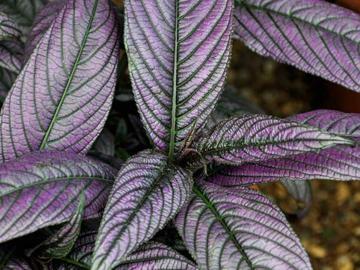 Very showy tender foliage plant. Subshrubby habit with square sectioned stems and glossy, metallic irridescent, green and purple leaves, all purple on the undersides. Short spikes of small funnel-shaped, pale violet flowers. Evergreen unless subjected to low temperatues, which may kill top-growth. Needs good light and warm humid conditions. Best in light part-shade, avoiding strong mid-day sun. Consistantly moist, fertile compost. Not frost hardy, although well established rootstocks may re-sprout. Best kept above 7°C. Pinch out shoots to encourage bushy growth. Conservatory plant, summer bedding, tropical and sub-tropical gardens.